You expect your sweatpants to feel cozy and remain wearable for a long time. Jerzees 973 8oz. NuBlend® Sweatpants deliver on both of these criteria, with classic styling and brand reputation you can trust. 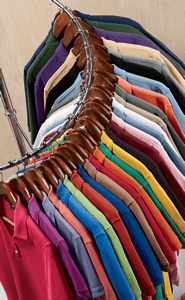 NuBlend® is dense fleece created to resist “pilling” -- which are those unwanted tufts of fabric that can pop up after washing, keeping your pants’ surface uniform for a longer period of time, even after numerous washings. This is also important due to the high stitch density, which creates the smoothest exterior for your heat and silk screen applications. The two-needle covered elastic waistband is designed to snap back into shape, and the inside drawcord gives you additional options for how you wear your pants. The elastic bottom leg openings keep the pants from riding up while you bend, move, and flex, and keep your pants off the ground and away from other wet/muddy elements.